The Montana Grizzlies finished ticking the boxes of fall camp preparation Tuesday, with newcomers and vets fitting equipment, gathering in meetings with coaches to outline expectations, and hitting the weight room for the first lift of the new season. On Wednesday afternoon the team took the field for the first official practice as they build toward kickoff against No. 13 Northern Iowa on Sept. 1, under the lights at Washington-Grizzly Stadium. It will be the first step in achieving the team’s new overarching goal: RTD. Return To Dominance. As in, the dominance Montana enjoyed during head coach Bobby Hauck‘s first tenure as Grizzly mentor. A dominance that led to seven-straight Big Sky championships, three national title appearances, an 80-17 overall record and three undefeated seasons in conference play. To get there, the Griz will need to score points and lots of ’em. Luckily, scoring points is something they have the tools to do. Offensive coordinator Timm Rosenbach returns five starters, 13 lettermen and three All-Big Sky performers to an offensive unit that produced the No. 9 total offense in the country last year, averaging more than 455 yards and 35 points-per-game. Fresh off summer’s player-run practices (PRPs – which are closed to coaches), the Grizzly offense returns to campus eager to prove it can produce big numbers again in 2018. “Indication from the players is that they enjoyed them (PRPs), and they were the best they’ve had since they’ve been here. Just talking to those guys, it sounds like they got better from them too,” said Rosenbach, who also serves as Montana’s quarterback coach. While adjusting to a new staff, a new offensive coordinator with new schemes, and a new quarterback competition, Montana’s offense proved it’s still got plenty of firepower during the spring season. 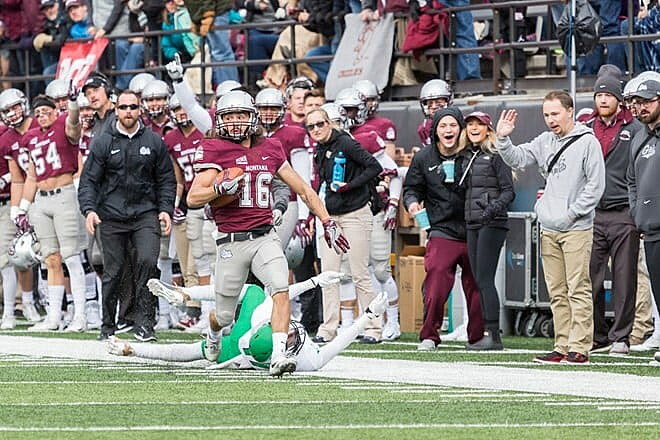 During the annual Griz Spring Game, Rosenbach’s offense racked up 42 points and 439 yards of total offense, with 362 of those yards coming in the air, and enters fall camp looking to build on that success. Junior quarterback Dalton Sneed emerged from the spring as the leader of a three-man quarterback race, completing 13 of 16 passes for 136 yards and a touchdown in the spring scrimmage. Since then, one quarterback has departed, and two more have joined (not including two incoming freshmen), making the QB battle four players deep, with Sneed the most experienced running Rosenbach’s offense. Boise State bounce-back Cam Humphrey, a redshirt-sophomore from Issaquah, Wash., joined the team for summer workouts after playing at Saddleback Community College in 2017, where he threw for 2,187 yards and 19 TDs. Also joining the QB race in 2018 is redshirt-freshman Wheeler Harris, a native of Mesa, Ariz., who spent 2017 as a walk-on for Nick Saban’s Alabama Crimson Tide. Humphrey and Harris will join rising sophomore Tanner Wilson of Polson and Sneed as the four quarterbacks in contention for a starting job this fall, with incoming freshmen Garrett Graves and Seamus Hennessy likely to redshirt. The quarterbacks will have the luxury of managing an experienced group receivers and backs as the 2018 offensive unit comes together. And nowhere are the Griz more experienced, or more electric, than in the receivers. Senior Keenan Curran returns for his final year in maroon and silver ready to lead a group that already features two of top-30 receivers in Montana history. Curran is poised to make a run toward the top of the all-time receiving yards list at UM with 1,548 yards to his name, putting him at No. 24 amongst UM’s career leaders. Curran also sits in the Grizzlies’ record book with 18 career touchdowns, the fourteenth-most in program history. “Keenan is kind of the leader of the group. There are a lot of talented guys there, but the key is going to be playing unselfishly – which they will do – and how well they block. They’re going to catch the ball and run great routes, those kinds of things, but the other parts of the game are going to be the things that help us become a complete football team,” added Rosenbach. Jerry Louie-McGee, a dynamic junior who sits at No. 30 amongst UM’s career receiving leaders also returns to thrill fans at Washington-Grizzly Stadium with 1,358 yards to his name. Rangy sophomores Samuel Akem and Samori Toure are back as well, giving the Griz more legitimate deep-ball threats. Toure is already in the Montana record books for the longest reception in UM history without a touchdown – an 80-yard catch that saw him stopped just short of a score against Savannah State in 2017. He made up for it with an 81-yard TD catch against at Weber State later that year. Senior tight end (and former quarterback) Caleb Hill returns for his last season in Missoula. Hill and junior Colin Bingham (winner of Montana’s President’s Award for the male student-athlete with the highest GPA in the department) will lead a position group that will be new to the Grizzly offense this year, with six players total in the mix to be targets for UM’s QBs. During his first dominant run at UM, Hauck’s offenses were known for a bruising rushing attack that resulted in some of the greatest backs in Montana history coming through the program like Lex Hilliard and Justin Green, who now coaches the 2018 group. It’s another deep and experienced room for the Grizzlies, with seniors Jeremy Calhoun and Alijah Lee both proving to be powerful ball carriers. San Diego State transfer Adam Eastwood showed out as another hard-charging back during spring ball as well. Those three will be complemented by the shifty Rey Green and Terron Moses, both able to make defenders miss in a flash. “We’re just looking for the backs to continue to compete and take care of the football. We have a lot of depth and talent there, so we just have to see how it shakes out as far as who can stay healthy, who can handle X amount of touches,” said Rosenbach. If there is a group to focus on in Montana’s offense, it’s the O-line, a young, but plenty sizeable group waiting for new stars to make a name for themselves. Junior Angel Villanueva is UM’s most experienced lineman, having started every game of his college career (22 games), and carries the most starts on the team. While Villanueva is expected to be an anchor at guard, no one else in the room has made a start. But with most everyone else hovering around the 300-pound mark, coach Chad Germer‘s group just needs more reps to find out who the starters will be. Sophomore Conlan Beaver has impressed with his high work rate at tackle, while junior Dallas Hartproved to be mobile as he transitioned to center from guard. Brandon Scott, a sophomore who stands at 6-7 and checks in at roughly 300-pounds is a natural fit to fill the other guard position, while freshman Colton Keintz made strides toward a starting job at tackle during spring ball. The Grizzlies open their 21-practice fall camp schedule at 2:30 p.m. on Wednesday at Dornblaser Field, on the south end of the UM campus.